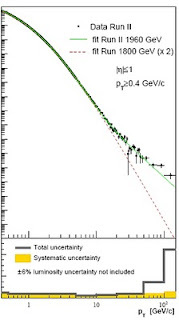 The CDF multimuon anomaly that hit the news 18 months ago is now almost forgotten (though not quite explained away). It appears that Tevatron's CDF results harbor yet another disturbing anomaly. The story goes back to an innocuous measurement of the transverse momentum of charged particles in minimum bias events. In particle physics slang, minimum bias stands for boring, routine measurements. Minimum bias events typically feature soft (low momentum transfer) QCD interactions between colliding hadrons, and normally would not be even recorded on tape because they happen too oftent and do not contain anything we consider interesting (like hard jets, electrons, muons, or missing energy). Only a small random subset of minimum bias events is kept to provide a control sample for tuning monte carlo simulations of hadronic collisions. Fast forward. A year later a number of theorists began to ponder on the CDF result. Last month, Albino et al. concluded that the discrepancy is too large to be swept under the carpet of theoretical errors, and went as far as suggesting a violation of the QCD factorization theorem. Somewhat later, however, Cacciari et al argued that even such a radical proposal is not a viable explanation. 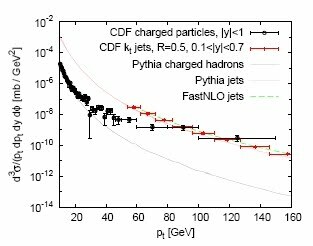 They observed that for pT of order 100 GeV the charged-particle cross section measured by CDF becomes comparable to the jet cross section measured elsewhere. This means that the excess cannot have anything to do with QCD-like events (unless one assumes that jets in this momentum regime contain on average one high-pT charged particle, which is both absurd and inconsistent with measured particle distributions within jets). If the effect is real, the culprit events must be very different from QCD so that they do not affect the measured jet distributions. Could this be new physics then? High-pT tracks could be left by heavy long lived particles (the likes of charginos or staus in some versions of gauge mediation, or R-hadrons in split supersymmetry).The problem, much as in the case of the CDF multimuon anomaly, is the huge cross section of order tens of nanobarns required to fit the data. Recall that typical models of new physics at the weak scale predict cross sections at least ten thousand times smaller - of order picobarns or less. For example, a 10 nanobarn cross section would correspond to a 20 GeV gluino. It is hard to understand how new physics produced in such large quantities could have escaped detection by multiple searches at the Tevatron. 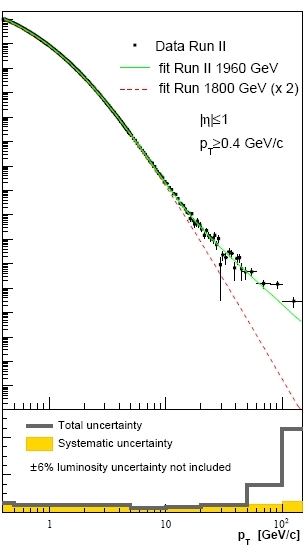 So far, no one has come up with an even remotely viable new physics model explaining the high-pT anomaly from CDF. At this stage, the most likely explanation is that the anomaly is an experimental error. Maybe a small subset of tracks was misreconstructed so that they appear to have larger momenta than they really have, or maybe a grad student accidentally spilled coffee on the data. Nevertheless, it is mind-boggling that such a large chunk of intriguing data could pass completely unnoticed for so long, just because the discrepancy showed up in a different place than everybody was looking. What else is hiding in 7 inverse femtobarn of data acquired so far by the Tevatron experiments? what do D0 see? Seems like the order zero question here before dealing with exotic models of new physics. That last paragraph isn't fair to the number of people that are hard at work there. You make it sound like no one is working - there are a dedicated core of people there. That machine and the experiments most-definately do not continue runnig by inertia. That said, the parking lots are definately more empty than they used to be. But, please, lets not be unfair to everyone still working there extracting all the physics they can. If you want to know what the status of that analysis is in DZERO you can send an email directly to the spokes or the QCD convenors and ask. Oh my, i should have put an irony mark there...i didn't expect anyone would take it literally. Sure, all windows are in place, the number of rats is within limits, and many people are still working hard on the data. What is fair to say is that Tevatron analyses are dramatically undermanned (except for higgs searches), now that most experimentalists have moved on to the LHC. And i think it's a pity. Dear Jester, when you notice that certain portions of the graphs were not studied too much because deviations were not expected there, it's a double-edged sword. On one hand, it may increase the probability that new possibilities are missed over there and no one is ready. On the other hand, it also increases the probability that the discovery is bogus because no one has too carefully studied what is the "normal" answer in those understudied regions. nice post. Indeed, if we missed new physics in inclusive charged particle multiplicity, this would call to question the whole setup of high-energy physics experiments in the last forty years or so... Quite a thought. One point. The minimum-bias trigger does not record random beam crossings (that would be called "zero bias trigger"). Minimum bias usually requires the minimum amount of coincidences that allow to discard the hypothesis that no interaction has occurred. Tommaso, do you believe then that CDF messed up this analysis and the internal refereeing process failed? Will we get any insightful series of posts like we did for the multi-muon excess? Thanks Tommaso, I in fact wasnt aware of that minimum/zero bias distinction.